Dishcrawl, based in San Jose, has spread its food-tour wings throughout the US and Canada. Their expansion into the Triangle is new, with the first Dishcrawl being held in Raleigh last February. 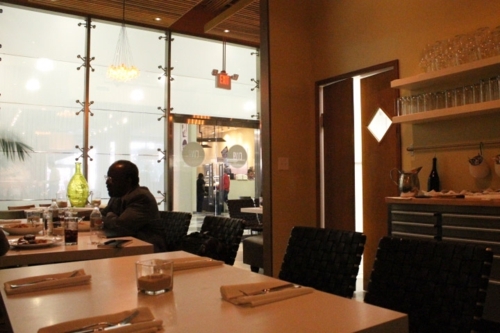 Durham’s Dishcrawl debuted last week over two separate evenings due to high demand. I attended the first night on a press pass (which is my obligatory disclaimer that this $45 tour was free for me). There are a few things that set Dishcrawl apart from other local food tours. First, they focus on one neighborhood and the cuisine you can hit within walking distance of that neighborhood. Five Points was the neighborhood this time, though the argument could easily be made that it was more of a downtown Durham jaunt than specifically Five Points. Second, they keep the particular destinations secret up until the moment you enter the next storefront. That means there’s a fair bit of prying to get the Dishcrawl ambassador, the sweet and congenial Hayley Teater in this case, to spill, so knowing how to keep a secret is in the job description. The first location is revealed by email the day of the event because the group needs to meet somewhere! On this night, Taberna Tapas was the place of origin. 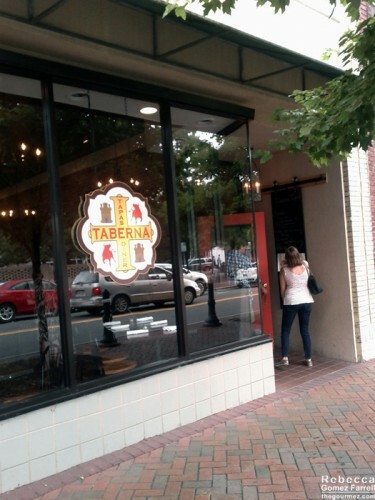 I had never been to Taberna, so I was excited to begin there, and I think it was probably my favorite of the stops. Chris, the owner, explained to us that he had redone the interior of the restaurant himself, using a lot of reclaimed and repurposed wood and fabric. He aimed for a rustic yet chic feel with clean lines, and I think he achieved that in both the décor and his food. We were served a trio of small bites. From left to right is a bacon croquette, a smoked salmon crostini with goat cheese and a stuffed olive, and an avocado and Spanish chorizo crostini with shallots. The croquette was well executed, its texture wavering between creamy and toasty with a paprika-infused crust. The salmon tasted nice and smoky, and I still dislike olives, but the saltiness of this one contrasted nicely with the richness of the cheese. 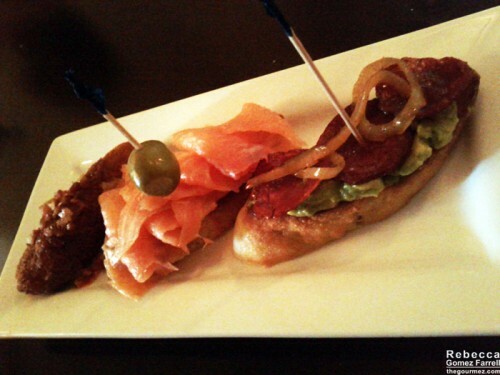 The best offering was the simple avocado and chorizo crostini. It’s my ideal comfort food, something I could whip up in my kitchen that gives me the rich avocado I love and the spice of chorizo with it. Our second stop was a block up the road at Revolution, which I’ve enjoyed a number of times. Inside Revolution on a previous visit. We were seated at the family table by the closed caption views of the kitchen, which excited several members of the group. The cocktail list was a big hit, but the appetizers were on the small side—I was grateful for the delicious peasant bread also served. The platters held ahi “poke” tuna with cucumber, greens, and wasabi caviar; housemade potato chip with steak tartare; and a crostini with whipped goat-cheese mousse, local arugula, heirloom cherry tomatoes, and vin cotto. 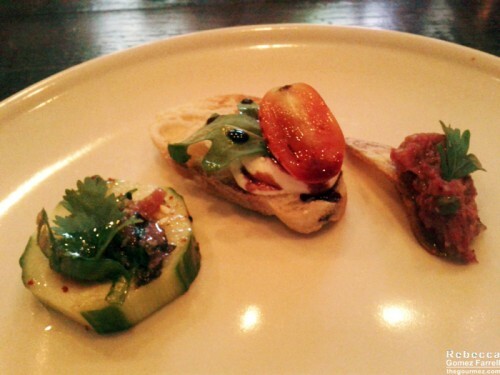 The steak tartare and chip was a fun combination of textures, but the crostini was the group favorite. For me, the balsamic on that was too sweet to pair with the goat cheese, but nobody else had that hang-up. I preferred the tuna and the subtle undercurrent and crunch of the wasabi caviar. We walked down to the American Tobacco district next and ended up at the Durham branch of the small Cuban Revolution chain. Cuban Revolution on a previous visit. They offered their most popular item, which is the iconic cubano sandwich, of course. It was served with rice and beans and maduros. 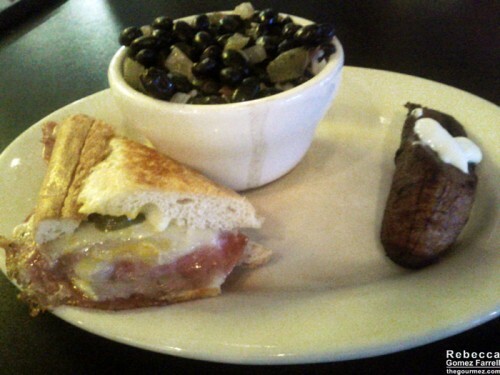 I’ve enjoyed most of the food I’ve had at Cuban Revolution, but I hadn’t tried their cubano, and it was delicious! I could see purists rejecting it because it’s heavy on the mayonnaise and light on the mustard and pickles, but those are all plusses for me. The rice and beans were especially good and moist with refreshing lime and herbs mixed in. I liked the savory cinnamon coating on the maduros as well. Our final stop of the evening was a few doors down at another restaurant I can highly recommend: L’Uva Enoteca. The view from my first L’Uva visit. An Italian restaurant was a surprising stop for dessert, but Chef John Tate used to be the pastry chef at Revolution, so it actually made sense. 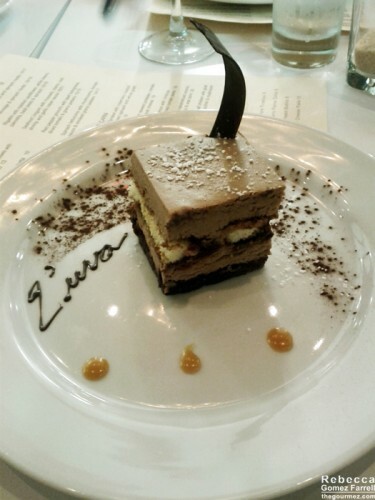 He personally prepared our chocolate tiramisus, and we were given complimentary tastes of a Lambrusco Rosso, which is a fruity and carbonated red wine, to wash it down. The presentation was lovely, and the chocolate flavor was a nice switch from a typical tiramisu’s vanilla, but I did want more rum presence. The dots tasted of butterscotch and were mainly for decoration. We were a small group of about 10, but the next night had 40 people on the agenda, so I think it’s safe to say each Dishcrawl will have a different dynamic. Our group was a mix of folks new to Durham and visitors who were in town for a limited time, and we had the opportunity to get to know each other fairly well, spending about thirty minutes at each location. Alcohol is available to purchase at the restaurants, but it is not part of price tag. I think it might be more convenient for drinks to be offered as an add-on to the ticket rather than paying for them at each location. Regardless, Hayley deserves props for her ability to guide conversation subtlety, which is a great skill for tour guides to possess at events like this, and a tour full of fellow foodies who will enjoy the surprise locales and dishes always makes for a fun evening. The next Dishcrawl in the Triangle is in Raleigh on 7/24, and you can get more info here. Keep your eyes on @dishcrawldurham’s twitter for the next one to be scheduled in the Bull City, because there’s no regular schedule. I was on the Wednesday tour and it was a different dynamic. Half of 40 went to the one choice while the other half went to the other and then we swapped. A few media sprinkled in the total tour, but most were local foodies looking for a good time. Wednesday’s tour was slightly different, too. We started at Pop’s, Revolution, Taberna Tapas, and ended at Parlour’s storefront. Great post, as I wanted to see what Tuesday was like. Interesting differences! I think because Tuesday night was the overflow, it was easier for less avid foodies and more curious visitors or newbies to get a ticket. I do regret missing out on Parlor, though. Still haven’t tried them!